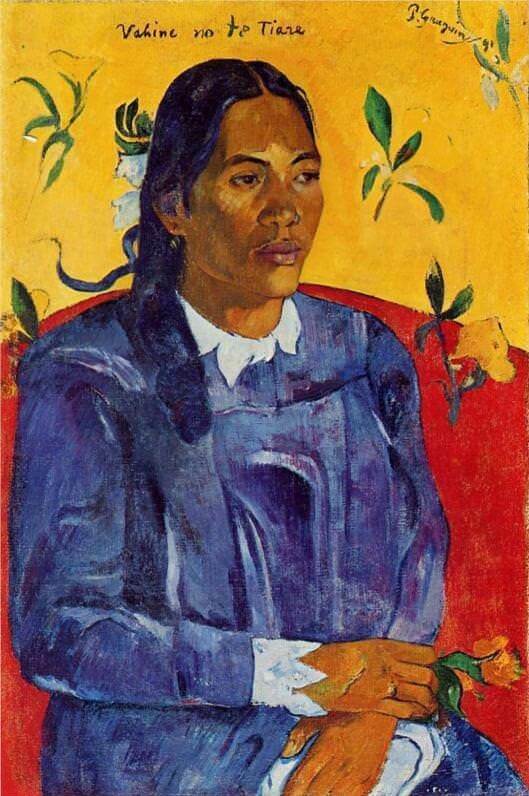 This portrait was one of the first pictures Gauguin painted on Tahiti. In Noa Noa he wrote: "In order to familiarize myself with the distinctive characteristics of the Tahitian face, I had wished for a long time to make a portrait of one of my neighbours, a young woman of pure Tahirian extraction. "While she was curiously examining certain religious compositions of the Italian primitives, I hastened, without her noticing it, to sketch her portrait. She saw it, and with a pout cried out abruptly, 'A ita!' (no) and fled. "An hour later she returned, dtessed in a beautiful robe with the tiare'beh'md the eat. Was it coquetry? Was it the pleasure of consenting of her own free will after having refused? Or was it simply the universal attraction of the forbidden fruit which one denies one's self? Or more probably still, was it merely a caprice without any othet motive, a pure caprice of the kind to which the Maotis are so given? "Without delay I began work, without hesitation and all of a fever. I was aware that on my skill as painter would depend the physical and motal possession of the model, that it would be like an implied, urgent, irresistible invitation. "She was not at all handsome according to our aesrhetic rules. "All her traits combined in a Raphaelesque harmony by the meeting of curves. Her mourh had been modelled by a sculpror who knew how to put into a single mobile line a mingling of all joy and all suffering."